We might also observe the visual achievements of the pinned prayers. Pray-ers choose from four colored square sheets: blue = “PRAYER REQUEST,” white = “SALVATION REPORT,” pink = “PRAISE REPORT,” and yellow = “REDEDICATION REPORT.” One imagines that, from one day to the next, the rainbow effect varies, telling a story about the human interiors that are present on that particular day. 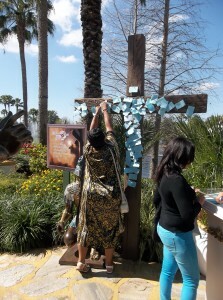 Notice, too, that these pray-ers color inside the lines, one-by-one forming a layer of prayers atop the wooden cross. As vital as these material and bodily acts, dimensions, and technologies are, I offer this example with a slight recalibration in mind. Here, the materiality of prayer is also about transforming a prayer into a thing: a small piece of writing. What happens when prayers become things? One answer to this question is suggested by a sign that stands a short walk from the Testimony Cross Garden. When these prayers become small pieces of writing they become something that travels easily. Small pieces of writing can be gathered, packed together, given “transportation” (note: not “mailed” or “sent”), and “placed between the ancient stones.” Of course, the destination of these traveling prayers is not incidental. 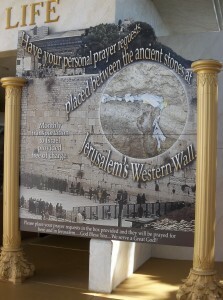 Jerusalem’s “Western Wall” is a featured site for Protestant pilgrims to the Holy Land. Christian claims to the Wall, such as inserting written prayers into its fissures, also participate symbolically in the ongoing contest over biblical land, as the Wall is also valued and sought by praying Jews and Muslims. Making prayer into a thing is, in part, a matter of efficacy. 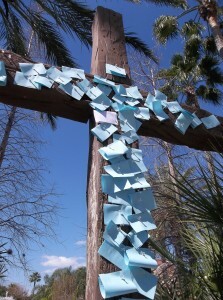 The power of your request or report is intensified when you write it out on a small square of colored paper; its intensification furthers when pinned to the cross; and, the prayer intensifies again when it travels to a crevice in the Western Wall. As these prayers become things, they also help forge a link between two places: a “living, biblical museum” in Florida and the Holy Land sites that inspire Orlando’s materialized re-presentations. The organizing conceit of HLE is the same as the one that led to the building of Palestine Park near Chautauqua Lake in 1874: while the sacred lands written of in scripture cannot be directly experienced by many Americans, their power can still be felt and remembered through material acts of re-creation. Here, producing prayer as a thing is part of producing sacred memory. Tracking what happens when prayers become things is an ethnographic achievement that becomes possible when we work “against [the] foundational narrative of prayer as a history of abstraction.” In the case of written prayers at the Holy Land Experience, the stakes of efficacy and sacrality become visible. If small pieces of writing on thin paper can do this much, what might the more elaborate versions of prayers-as-things do?